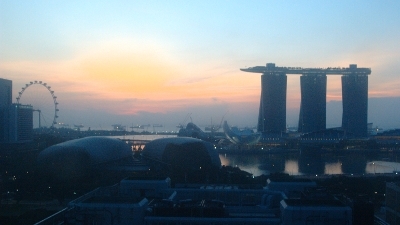 A sunrise view of Singapore’s Marina Bay and some of its futuristic buildings, including the Esplanade Theatres on the Bay and the Marina Bay Sands Hotel with its striking rooftop garden. “We were staying on the 16th floor of the Peninsula.Excelsior Hotel, in a room with two great views of downtown Singapore – one of Boat Quay on the Singapore River, and this one of Marina Bay. Looking across the Bay at night really made you feel as if you’d leapt forward in time a couple of centuries! This entry was posted	on Thursday 9 December 2010 at 08:08	and is filed under 2010, Singapore. You can follow any responses to this entry through the RSS 2.0 feed. You can leave a response, or trackback from your own site.